I’m so glad we had this time together. I just had a pre-senior moment. Getting out of the shower with my cute gathered shower cap on, a sideways glance in the mirror stopped me dead in my tracks. Give me a mop and bucket and there I am, a cartoon-inspired Carol Burnett cleaning up during the credits. Only those readers in their 40s and up can relate to my mind-numbing doubletake. I used to watch the Carol Burnett show faithfully as a young girl–and I still chuckle to myself recalling certain skits with Mrs. Hu-wiggins and Eunice and Mama–but what on earth made me flash back to that little cartoon Carol with the floppy cap on? 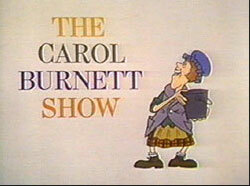 First, I smiled at the memory of the show and Carol Burnett. Then I stared at my capped self in the mirror and shouted, Oh my God, you’re OLD! When did my youthful self ever think I’d be wearing a shower cap and not washing my hair every day?! Shower caps are for grandmas and can only be found in dust-laden packages sitting on the back of a drugstore shelf. Was this really me? To add insult to injury, the fact that I saw in myself a figure from a 70s variety show didn’t help matters much. Yet another sign of aging I suppose, but I’m young enough to have a tiny part of me still believe in forever. I can’t quite fathom that someday my kids will be grown and have children of their own. That I will become the grandmother… smelling of rose water and reminiscing about the past, waiting for my grandkids to come visit. When that day comes, I’ll just smile and give my ear a wiggle, remembering the past fondly and looking forward to a nice hot shower without having to wash my hair. My favorite one to date! Love your blog and will enjoy your “musings” – definitely bookmark worthy! !